I like Japanese-style Italian, so I was naturally curious about Mondo Mio ("My World"), which has roots in Japan, with sister restaurants Piccolo Mondo ("Small World") in Osaka and Kobe. Mondo Mio is a casual little eatery offering Southern Italian cuisine, which leans more towards the use of olive oil than butter. We saw very value-for-money S$12 set lunches (soup/starter, main, dessert, coffee/tea) but opted to go a la carte. Our antipasto (small, S$12) comprised this mix above. 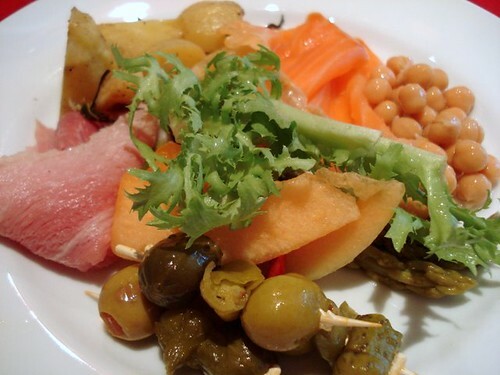 Smoked salmon, ham, potatoes, chickpeas, greens, asparagus, melon slices and some really great olives and pickles on skewers. A good deal but I can't help thinking about that divine antipasto platter from da Mario, just nearby. 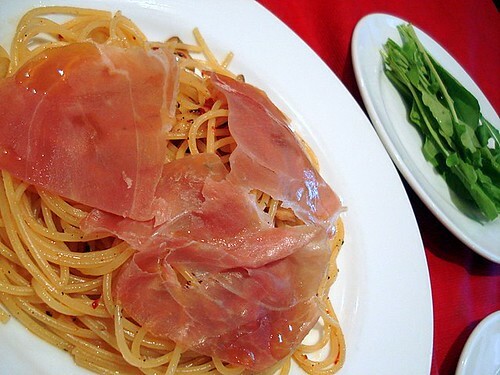 The aglio olio peperoncino with prosciutto and rocket is between S$14-18 (sorry we forgot to keep the receipt). We requested the leaves to be on the side, instead of on top - hubby doesn't like this peppery plant. It certainly was al dente but hubby still wasn't too enthused about this dish. On its own, the aglio olio may be a bit bland but the prosciutto makes it sing. Hubby loved the pizza though. 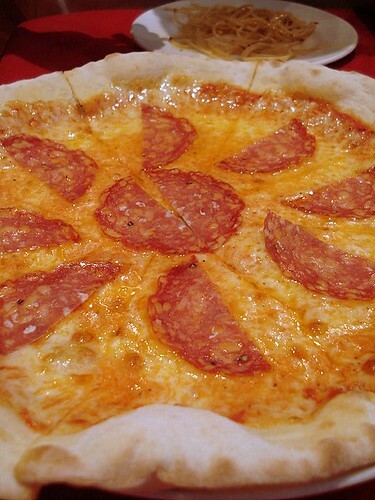 The Diavolo comes with lots of tasty, stringy mozzarella and paper-thin slices of salami. Lovely thin crust. I found it a tad greasy but I'd eat it again anytime. It's a busy little place, quite family friendly with lots of Japanese and Western clientele. Service staff are warm despite being constantly busy. The Italian manager was especially friendly to Nadine, kissing her outstretched hand with such dramatic flourish that she requested it again and again. hanrik: sadly, no. It's hard enough to find good Spanish food here, let alone Portuguese! K-man: Round 2? :) We should try Cugini too! err how was it japanese inspired though? wouldnt look too out of place in an authentic italian place?